They are composites of tungsten and copper. By adjusting the content of tungsten, we can have its coefficient of thermal expansion (CTE) designed to match those of materials such as ceramics (Al2O3, BeO), semiconductors (Si), and metals (Kovar), etc. 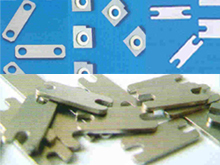 Our products are widely used in applications such as optoelectronics packages, Microwave Packages, C Packages, Laser Submounts, etc. Here is what our customers say about us! Copper Tungsten is one of the most popular refractory metal based heat sink materials offered today. With the new off-the-shelf system, we are able to offer standard products with a short lead-time at extremely competitive rates. For product and pricing information, please click here.